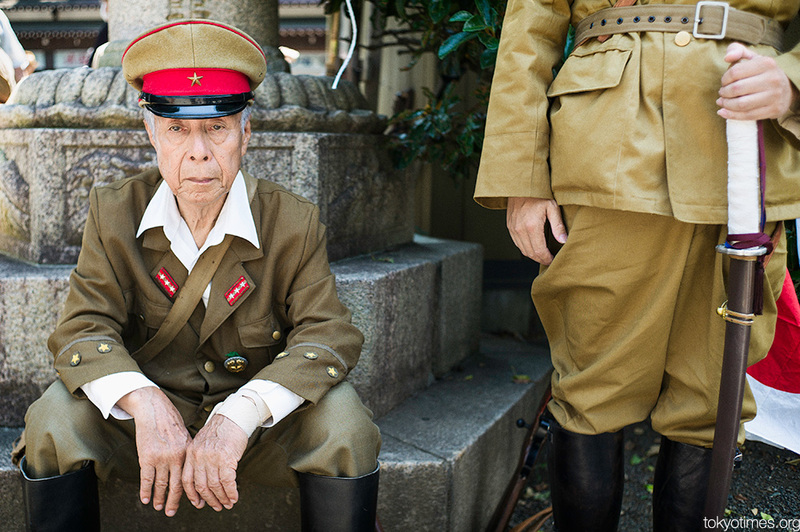 Tokyo’s controversial Yasukuni Shrine is a divisive place of worship at the best of times, but on August 15th, the anniversary of Japan’s World War II surrender, it’s an element that is even more pronounced. The vast majority of people are there for the right reason — to simply remember the past. The very noticeable contingent from the far right, however, are there to revere it. And some, quite possibly, are somewhere in-between. 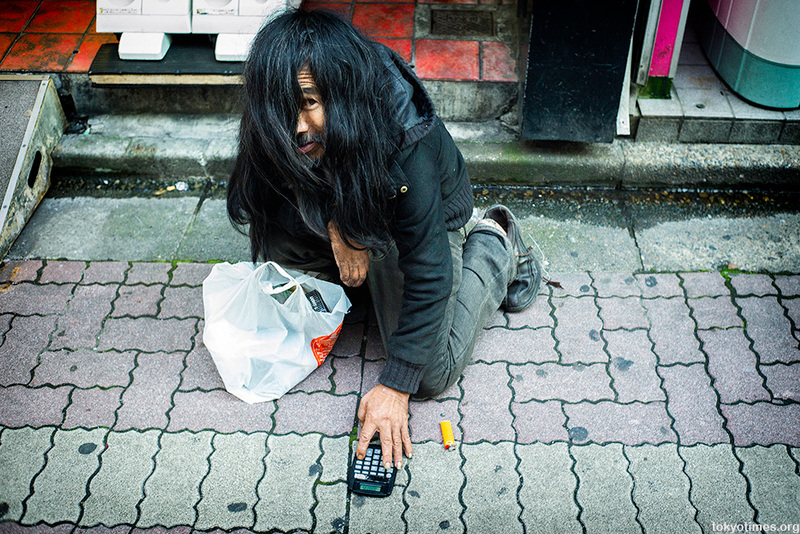 In Tokyo, the real price of poverty? No matter how many times one may hope for a different outcome, the total of nothing multiplied by nothing is unfortunately always nought. On National Foundation Day, events at Tokyo’s controversial Yasukuni Shrine are surprisingly low-key, with only a gathering of uniform-clad nationalists for a a brief ceremony, along with a smattering of more conventional visitors and curious onlookers. 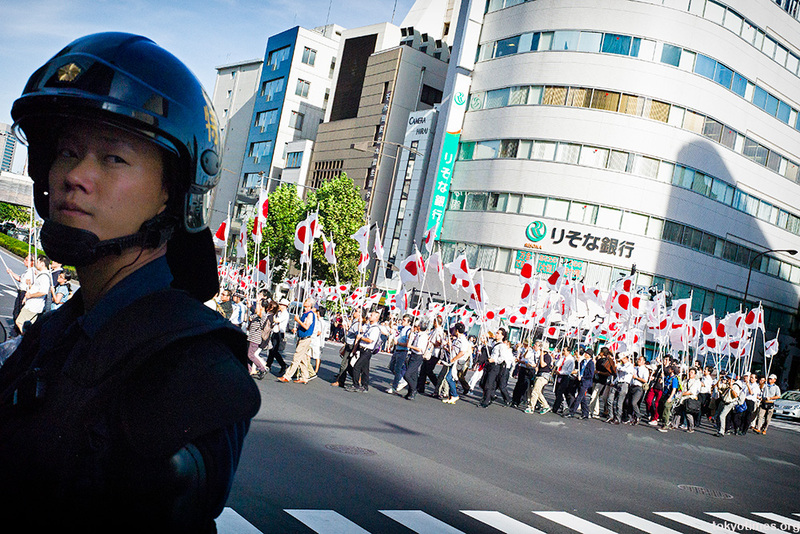 The anniversary of Japan’s surrender at the end of World War Two, however, is a very different affair altogether. There are more people to begin with. Way more. Including all manner of far right factions. Then there’s an impeccably observed and very moving minute’s silence held at noon. Plus later on in the day, disturbing and incredibly vocal animosity is directed at pro-peace marchers from the aforementioned right-wingers and their supporters. Fortunately, however, this aggression was, on the whole, countered by the friendliness of the vast majority of those present — a healthy percentage of whom were keen to stop and talk. So in many ways the image below seemed to sum up the day; namely a huge amount of people, and a quite staggering number of flags. All of which was watched over by a very strong, not to mention extremely visible, police presence. Due to the nepotistic, old boy network that masquerades as democracy in Japan, it’s not hard to understand why voter turnout is low, and apathy reigns supreme. A passing down of the positions of power that arguably makes the current, old Etonian filled cabinet of Britain, seem positively revolutionary. 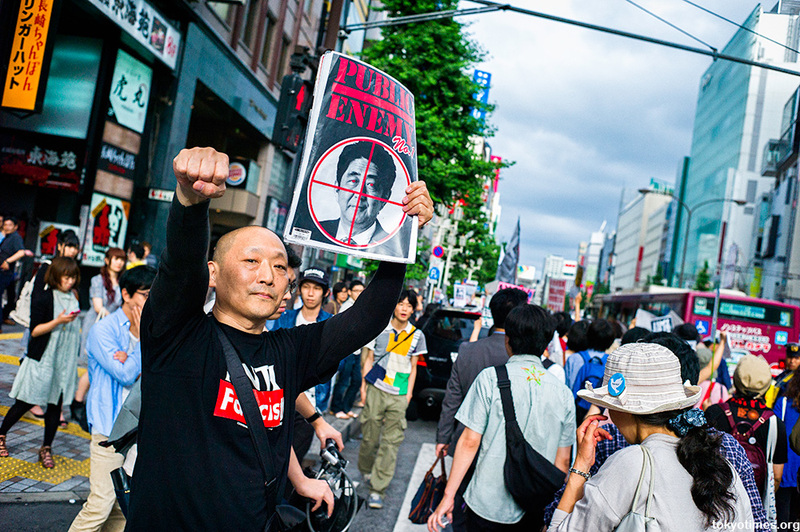 But thankfully there are signs that changes are afoot, with anti-government, and particularly anti-Abe protests becoming commonplace. 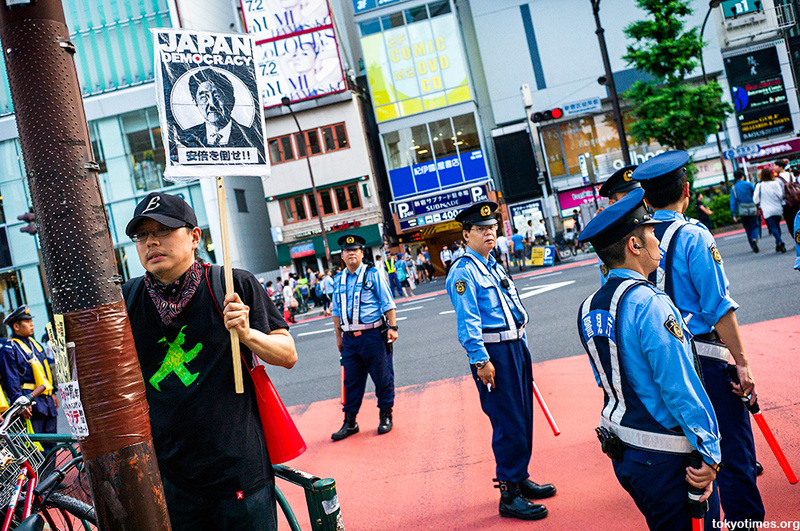 A movement that has been galvanised further by the Prime Minister’s recent reinterpretation of Japan’s pacifist constitution — this hugely controversial move coming only months after the same government rammed through a similarly contentious secrecy bill. The latter law making a mockery out of any kind of press freedom, while at the same time giving those in power all the freedom they need to block stories or restrict information. A massive shift to the right, and a worrying nod to the past, that tie in precisely with Abe’s hawkish, backward looking agenda. Policies that are being successfully rushed into being, while his much-touted, and politically motivated Abenomics, continues to falter. But as mentioned, opposition and public unrest is growing. Many people aren’t happy. Not by any stretch of the imagination. And the target of their anger is Abe. Of that there is no mistake. Due to Japan’s ageing population and the continuing migration to the country’s large cities, it’s not really surprising that an increasing amount of houses are now left empty, or in many cases, completely abandoned. Yet the actual number of homes in such a state perhaps is. In 2008 — the last time such statistics were calculated — the figure stood at 7.57 million dwellings, or 13% of the total number of houses. A tally that is now estimated at somewhere in the region of 18%, and is expected to rise to a staggering 24% by 2028. But such places aren’t merely restricted to less populated areas. Far from it. A combination of land/property tax incentives, plus a change in building regulations after the post-war period when many ageing wooden homes were constructed, means it’s financially beneficial to leave a property standing, regardless of its condition. 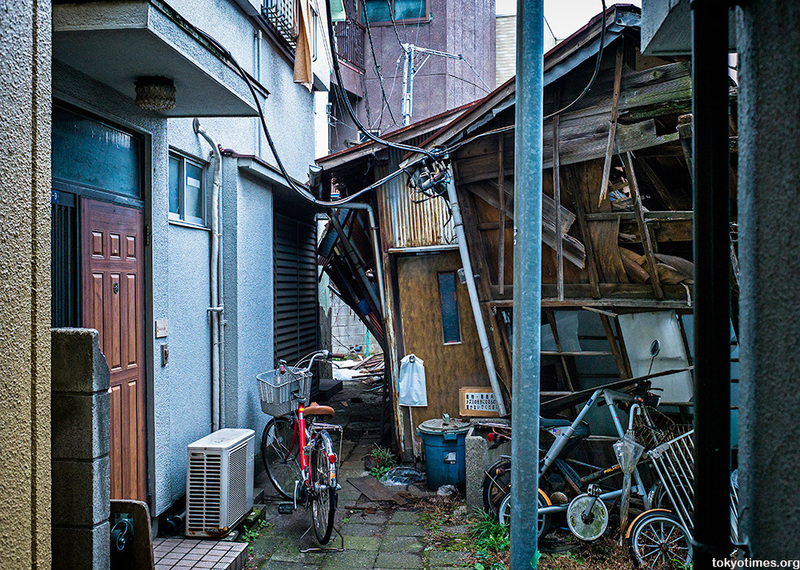 Something that probably explains the number of crumbling, ramshackle houses one can regularly see in Tokyo — particularly in the city’s older neighbourhoods. None of the many I’ve seen, however, come close to the shocking state of this semi-collapsed monstrosity. A truly awful eyesore for the neighbours, not to mention a structural concern, as it’s clearly only the modern building that is keeping the old one (sort of) upright. Japan’s current regime may be against her. 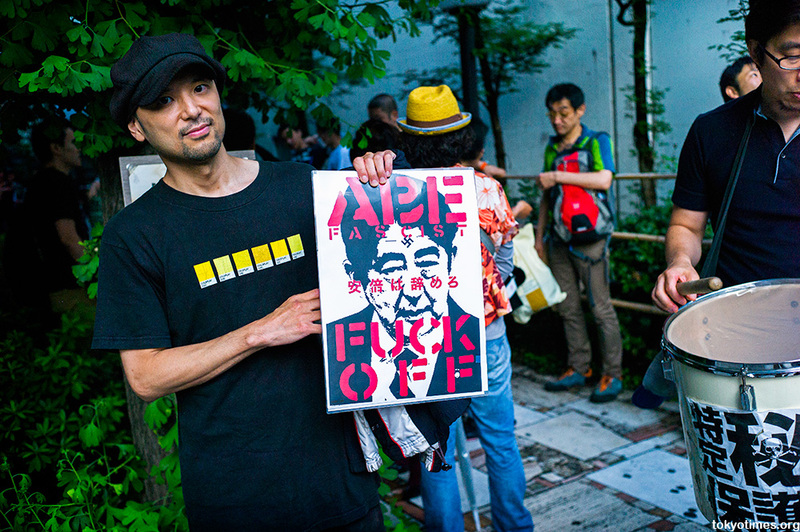 The same also goes for the likely winner of Sunday’s Tokyo gubernatorial election. Plus, with the country’s supposedly impartial public broadcaster, NHK, now unapologetically backing the government, there’s scant hope of her getting any coverage, too. But still she fights for what she believes in: battling away against the powers that be. 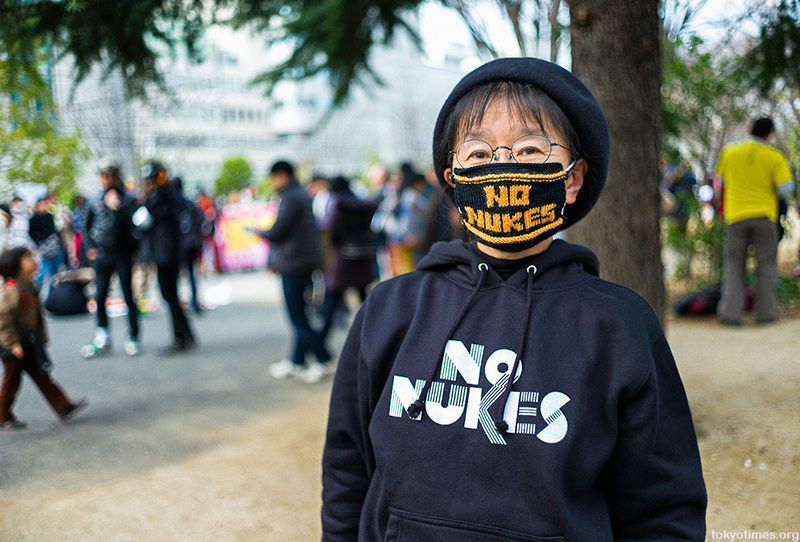 And with Japan shifting ever more worryingly to the right, this woman, and thankfully many more like her — whether they be anti-nuclear or pro-democracy protestors — will become increasingly important. Or at least that’s what one hopes.